The last Sunday of the football season can be a sad day for many of you die hard fans! It is not often that we get the opportunity to watch our favorite team battle for that prized Lombardi Trophy. This years match up will be one to remember! 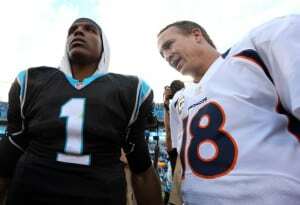 Cam Newton the new face of the NFL competing against one of the all time NFL greats in Peyton Manning. Will young blood be able to out duel the general in the biggest show of the year? Well, Vegas currently has Carolina at a 6 point favorite. Will Peyton Manning pull a classic Ray Lewis by Winning the Super Bowl to cap off his remarkable career or is Cam Newton here to spoil the party. Regardless of the outcome of Sundays game both teams have come a long way and proved to be a worthy opponent. I think it comes down to the ability for Denvers defense to get to the probabal MVP quarterback. He has looked unstoppable so far this year showing he truly is super man. Let’s face it he is just bigger,faster,stronger, and smarter than any other quarterback in the National Football League. The only person who may be smarter that Cam Newton is of Course the Seasoned veteran behind center for the Denver Broncos. Peyton Manning plays the game of football like a chess match trying to outsmart the enemy on each and every snap. Im sure if you have watched him play you are use to hearing all of the crazy call outs at the line “Omaha, Omaha” . He is arguably the best offensive leader that has ever stepped onto a football field. Will he have a Cinderella ending to his career or will he be forced to play another season in hopes of that World Title!